A fish-out-of-water story. Only these fish are trying to run the United States of America. 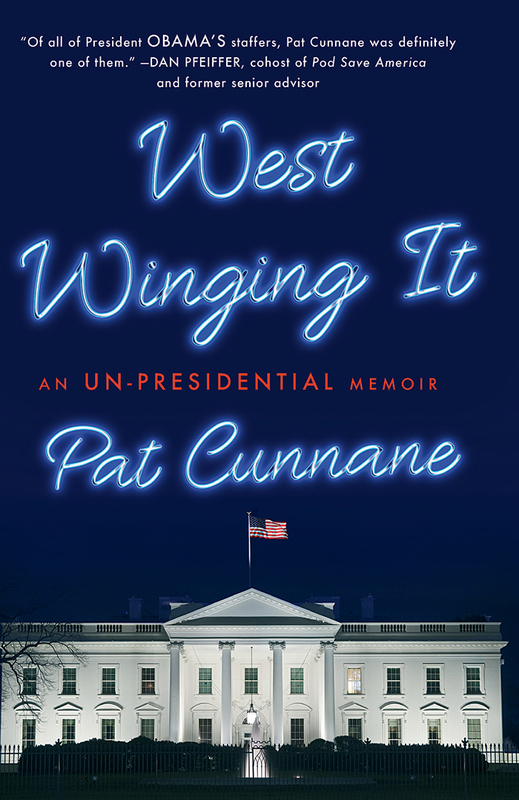 West Winging It is the hilarious and charming personal story of Pat Cunnane’s journey from outsider to insider – from a mundane job at a warehouse to his dream job at the White House. Pat pulls the drapes back on the most famous, exclusive building in the United States, telling the story of the real West Wing with compelling, eccentric portraits of the people who populate the place, from the president to the press corps. Pat takes you into the Oval Office, providing a witty insider’s glimpse of the minutiae and the momentous of what it’s really like to work at 1600 Pennsylvania Avenue. Along the way Pat draws an intimate portrait of the side of President Obama that few were privy to – the funnyman, the nerd, the athlete. He describes both the small details – the time he watched in horror as the president reached over the sneeze guard at Chipotle – and the larger, historic moments, such as traveling to South Africa for Nelson Mandela’s funeral or watching the president handle the news of the 2015 terrorist attacks in Paris. In some ways, working at the White House is a lot like every office, and in some ways, it’s like no office ever. Pat recounts the time he accidentally slammed a door on Joe Biden, plotted to have the Pope bless him by faking a sneeze, and almost killed America’s First Dog. Filled with sharp observations and exclusive photos, West Winging It is for anyone who has ever wanted to see behind the scenes at the White House.